The module automates steps like scaffolding, contig joining, and the ordering of contigs relative to each other or to a closely related reference genome. New for PacBio users: Easy and rapid error correction and assembly of PacBio data into gold-standard reference genomes. 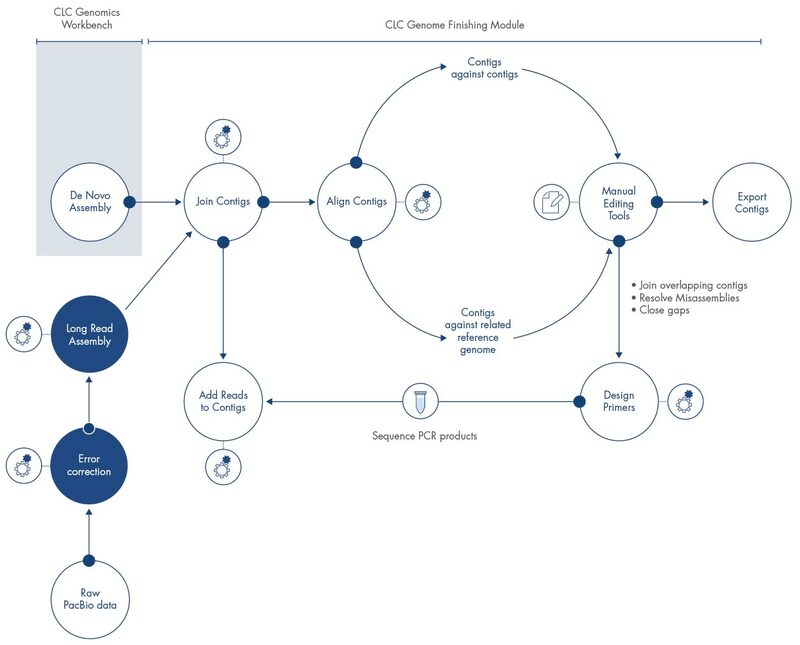 If it is necessary to amplify and resequence regions between contigs, CLC Genome Finishing Module identifies useful primer combinations for you. Once new amplicon data are available they can be readily used to improve an assembly. Automated steps improve the outcome of the initial assembly. Visually inspect and improve the remaining unresolved regions with the help of manual editing tools like the Analyze Contigs tool. Need high-performance computing? With the Genome Finishing Server Extension you can extend the features of the module to your CLC Genomics Server.